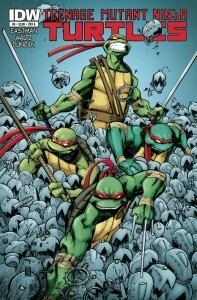 It’s nonstop excitement in this action packed issue of TMNT! Baxter Stockman’s latest inventions have found the Turtles lair in the sewers and it’s a scramble for survival… and not everyone will make it out safely! General Krang also provides the answers to some lingering mysteries! AND Casey Jones and April make an important connection?? This issue has it all!